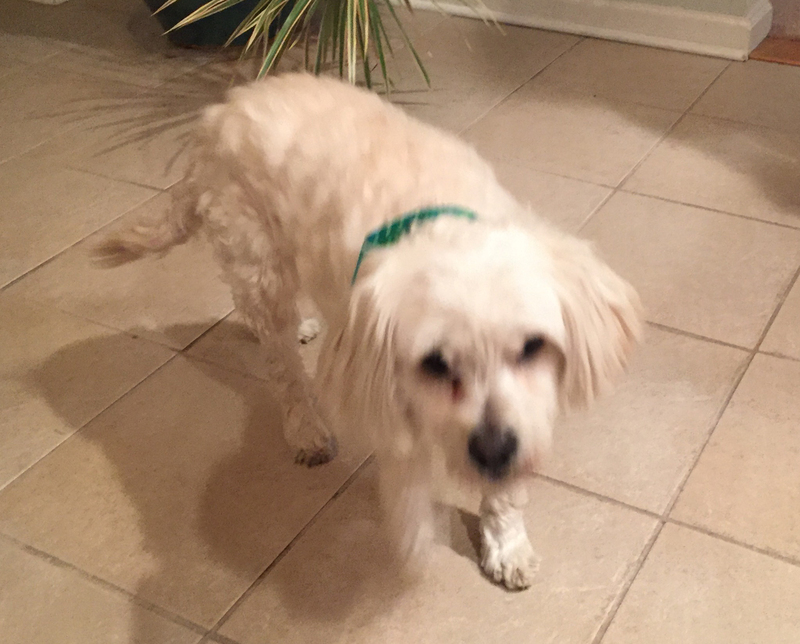 Actually their dog Chloe made an even half dozen attendees! 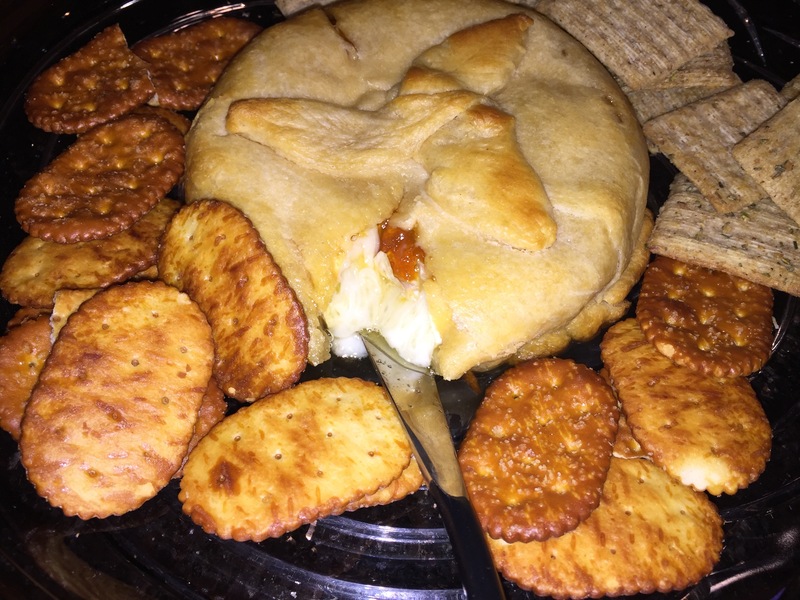 With cocktail hour, we enjoyed a baked brie with apricot preserves. 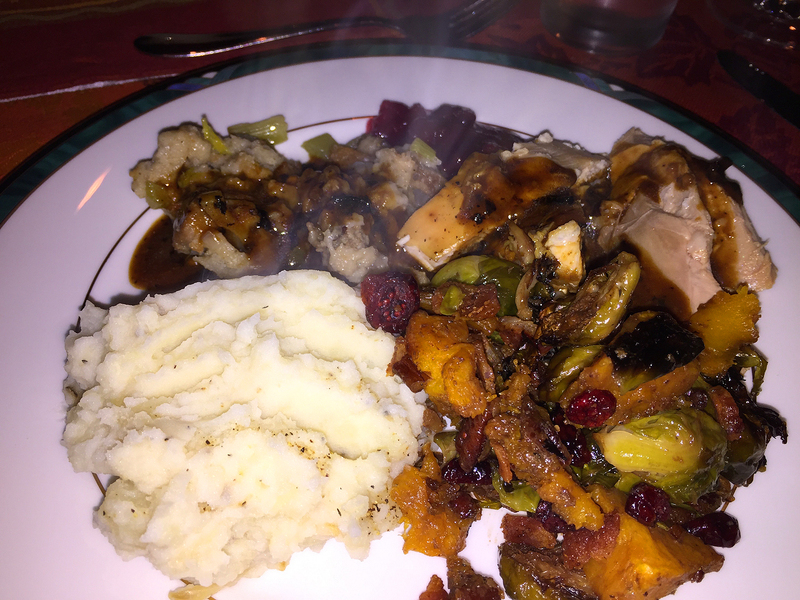 The star of the show, roasted turkey and stuffing. 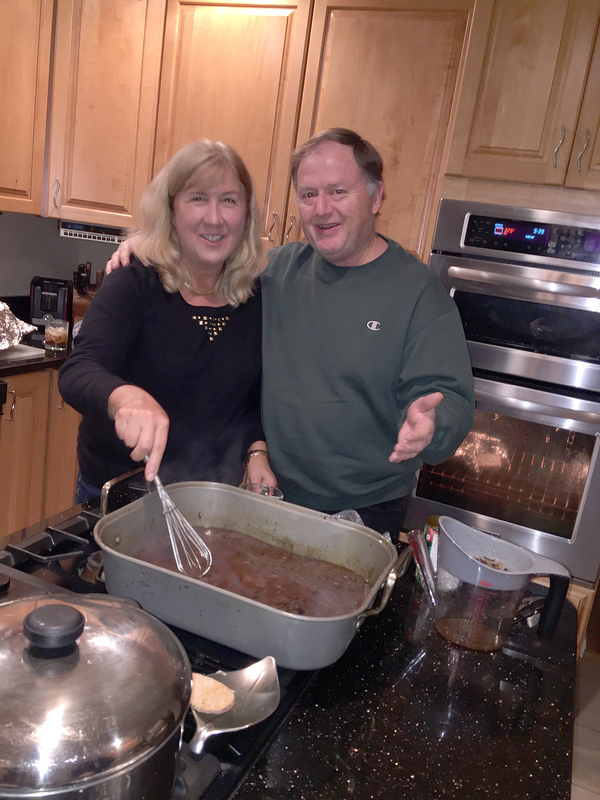 Barb and Brad showing off their gravy-making skills. When we arrived late in the afternoon, the 16-pound, picture-perfect turkey was just pulled from the oven and “resting,” allowing time for cocktail hour with a baked brie appetizer—and enjoyed on their outdoor deck because the weather was balmy for late-November. 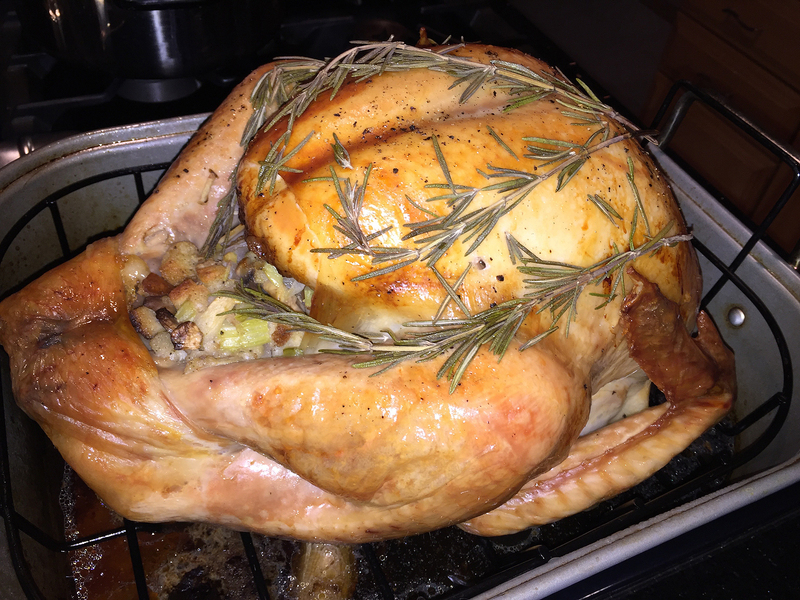 Brad informed us that they cooked their bird according to the recipe of Melissa Clark, The New York Times Columnist and Food Journalist—author/coauthor of an astounding 32 cookbooks. Not only did it look fabulous, it tasted great too! 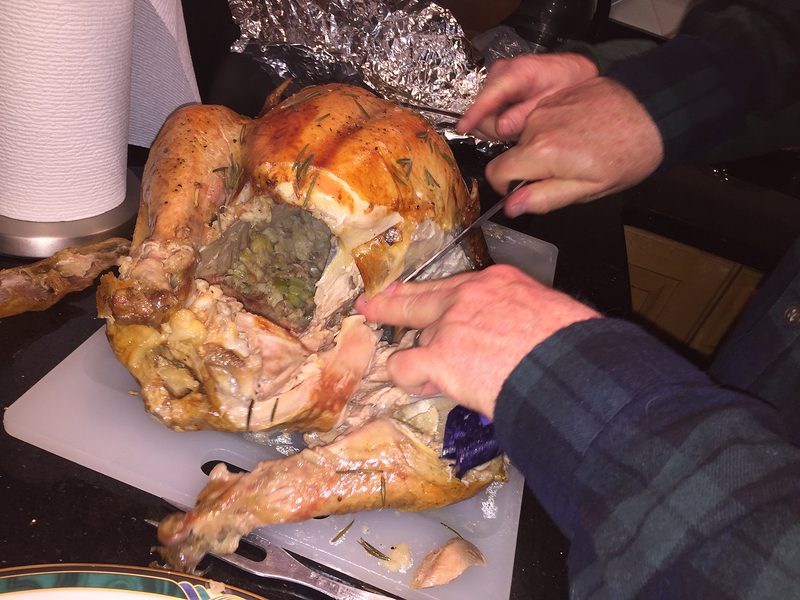 Russ assists Brad in carving the bird. 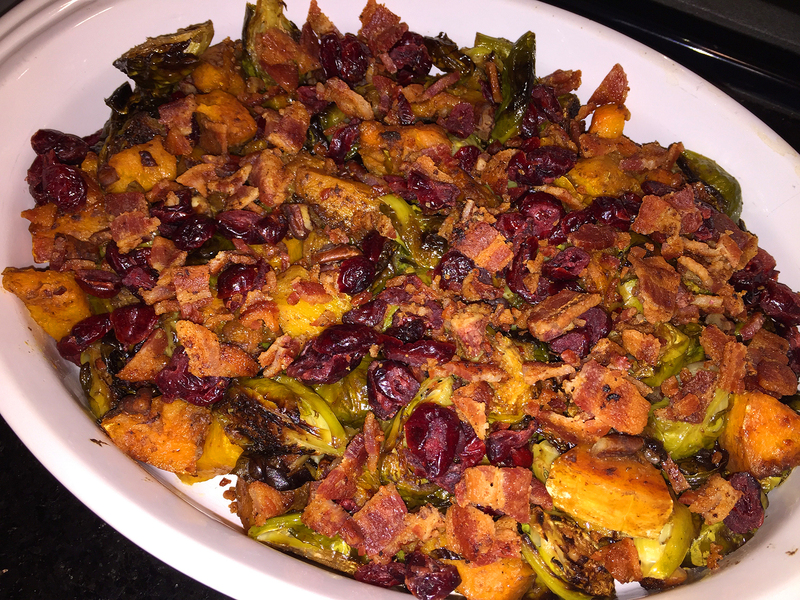 Along with sides of mashed potatoes, stuffing, and homemade gravy, I made a very colorful and delectable Maple Dijon Roasted Brussels Sprouts and Butternut Squash with Cranberries and Bacon (recipe follows). Of the two optional ingredients, we chose to include the crumbled bacon, but omit the Feta cheese. Because it came out of the oven almost two hours before we ate dinner, we did reheat the veggies for about 10 minutes. 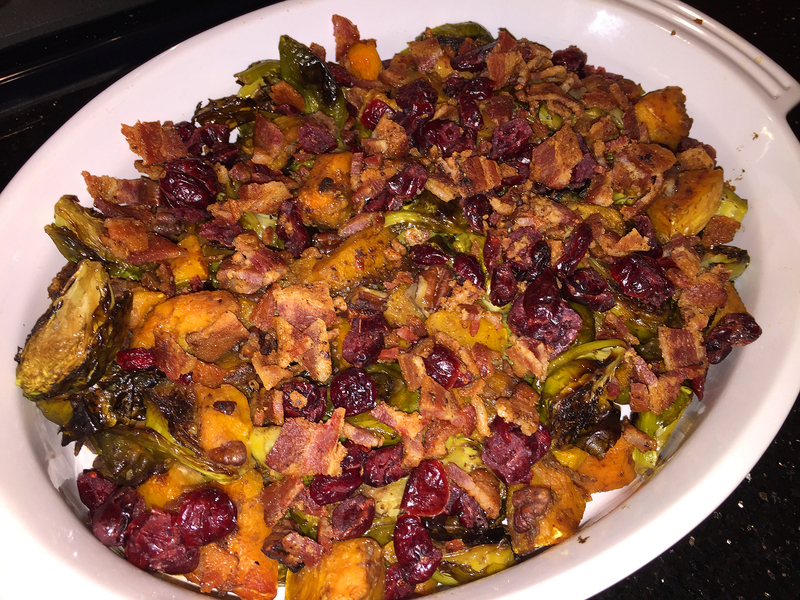 Maple Dijon Roasted Brussels Sprouts and Butternut Squash with Cranberries and Bacon. The plated meal with all the fixin’s. 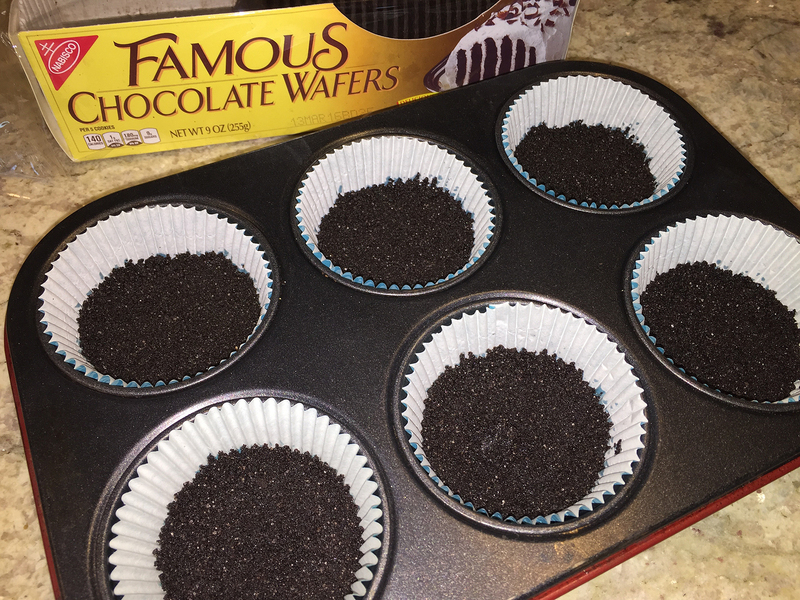 Preheat the oven to 325 degrees F and line a cupcake pan with paper liners. 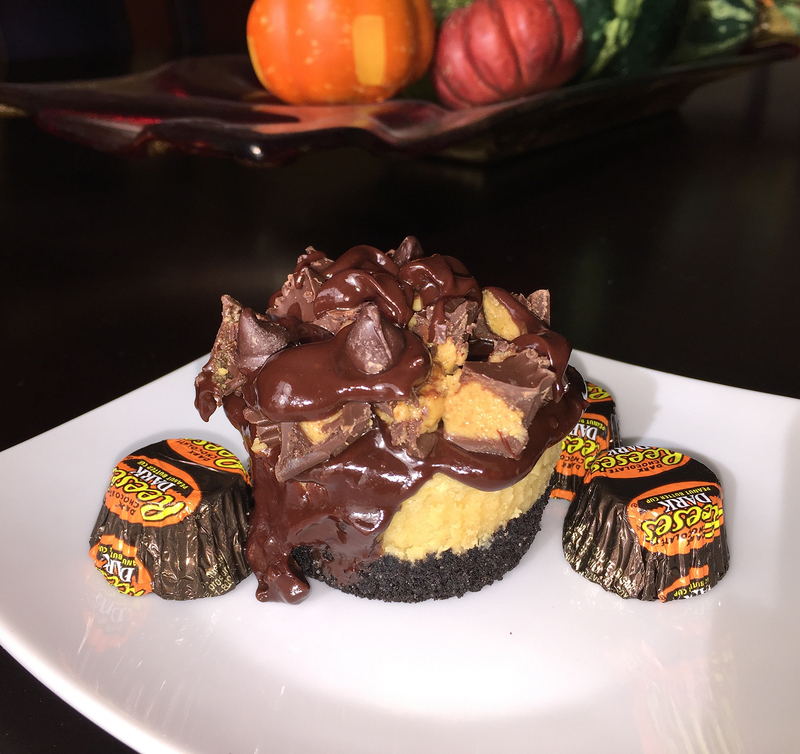 In a bowl mix together graham cracker (or cookie crumbs), sugar and melted butter. 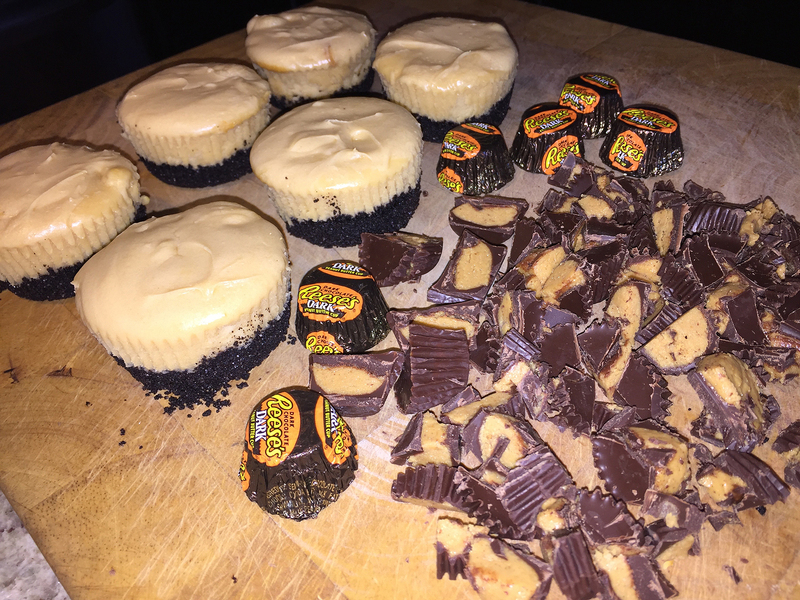 Divide crumbs in the cupcake liners and press it on the bootom. Bake for 10 minutes, remove from oven and set aside. 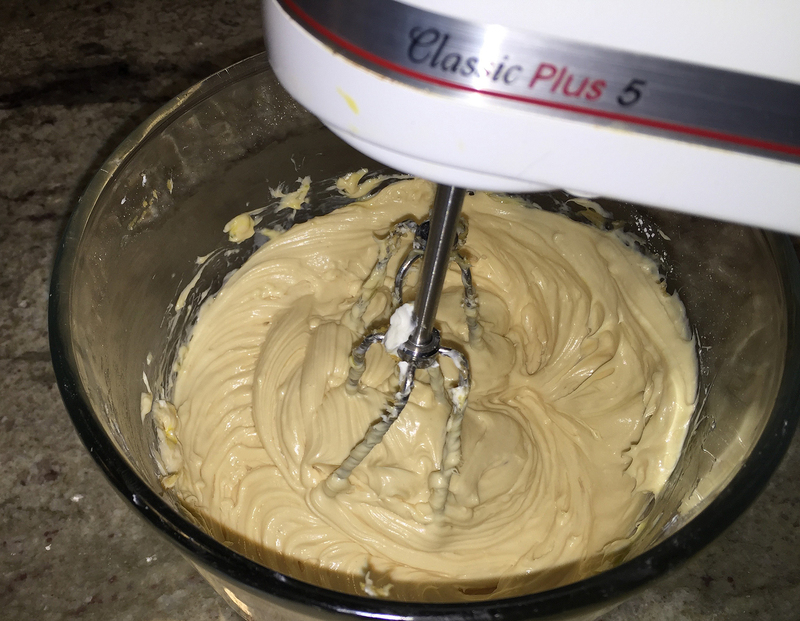 In a large mixing bowl, mix together cream cheese, peanut butter, powder sugar and vanilla on medium speed until well combined. Beat in eggs (one by one) until evenly combined. DO NOT OVER MIX IT. 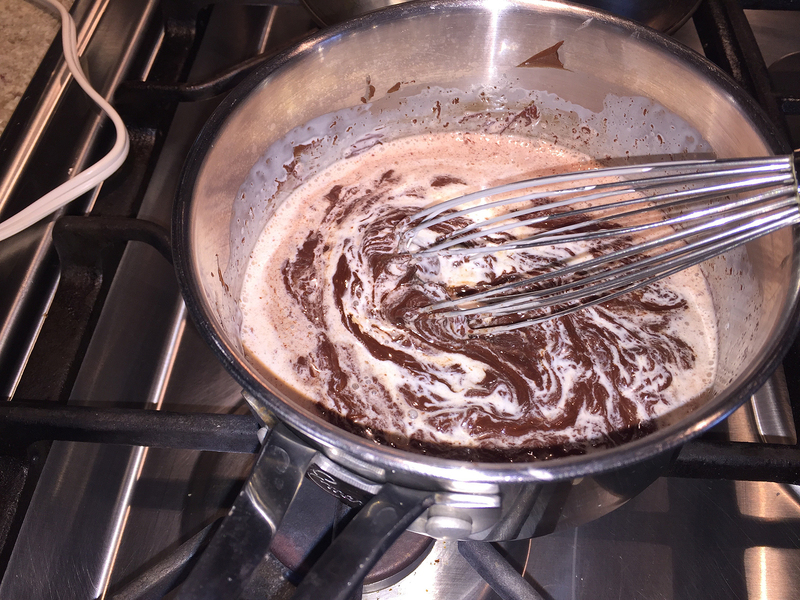 Melt the chocolate pieces and stir in heavy cream. 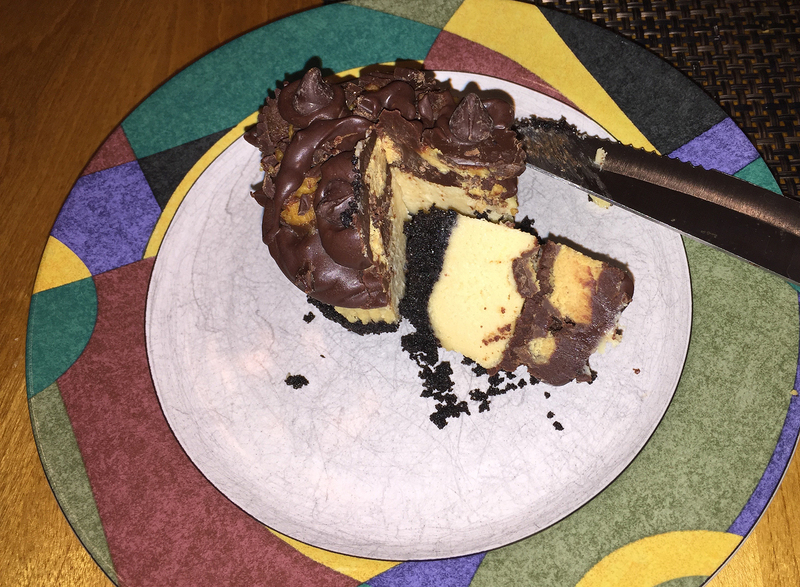 Spoon chocolate ganache on top of each cheesecake. After roasting for 25 minutes, and before the sauce and pecans are added. In a small bowl, mix together the Dijon Maple Butter Sauce ingredients. Set aside. Line a large baking sheet with foil or parchment paper. 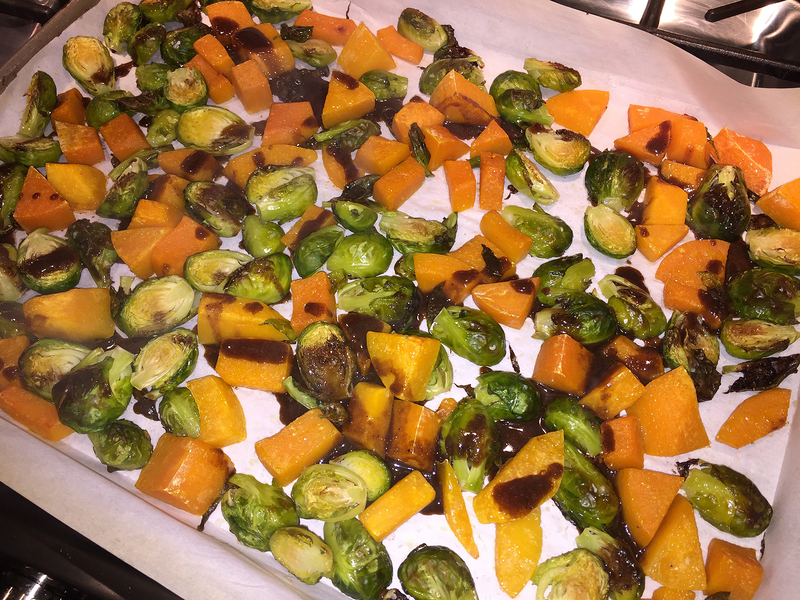 Add Brussels sprouts and squash, drizzle with olive oil and toss to evenly coat. Evenly spread out vegetables and roast at 400 degrees F for 25 minutes. Toss vegetables with Dijon Maple Butter Sauce and 1/4 cup pecans (it will seem “wet but will soak in the vegetables) then roast another 10-20 minutes or until squash is fork tender. Toss Brussels sprouts and squash with cranberries and feta and bacon if desired. Serve warm. 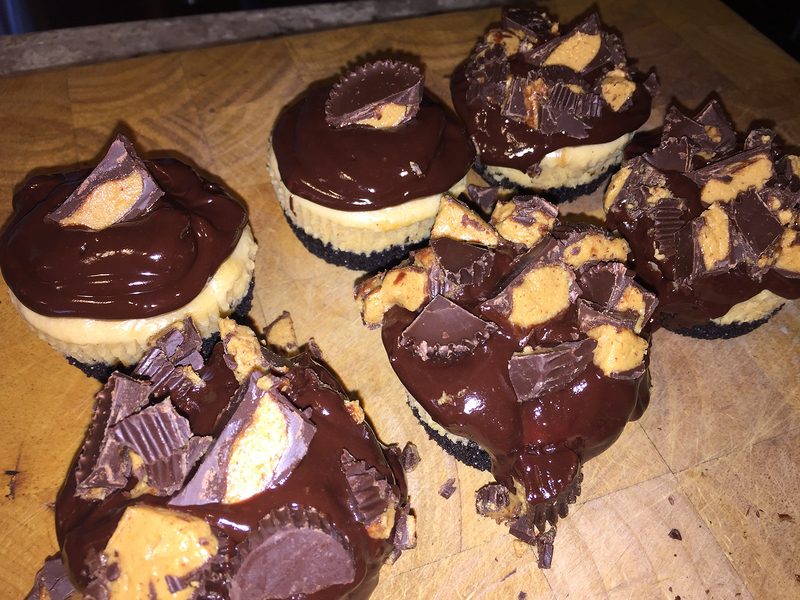 Close-up of the decadent Mini Chocolate Peanut Butter Cheesecakes.